Stay in a Tropical Luxury Virgin Gorda Villa - "On The Rocks"
Spending a vacation in a tropical Virgin Gorda villa will be a memorable experience. For a truly luxury time, stay at the Villa “On The Rocks”. As the third-largest of the British Virgin Islands in the Caribbean, Virgin Gorda is also the second most populous island. The Caribbean island isn’t all that large, only about 8 square miles in size. 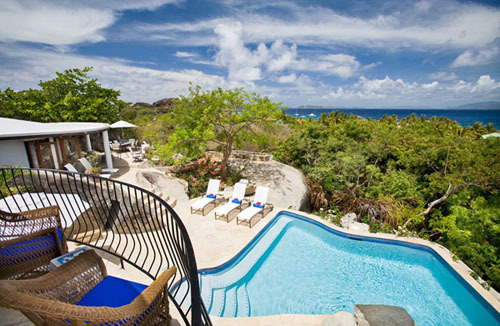 Wimco Villas offers a wide choice of luxury accommodations including a Virgin Gorda villa named “On the Rocks”. This luxury villa, also known as MAV OTR, sits among large boulders and tropical shade trees. It’s a contemporary 4-bedroom villa that consists of three circular pavilions. The main pavilion houses the Rising Sun Suite. This suites comes with a beautiful 4-poster king-size, enclosed in netting. The gorgeous French doors open to unveil a tranquil garden patio. You’ll find twin sinks in the bathroom, plus an outdoor shower surrounded by lush landscaping. There’s a 2-story guest pavilion beside the pool. Each level of the pavilion has two bedrooms. The floors are connected by a stylish, curved staircase. One of the upstairs bedrooms has a balcony that overlooks the inviting swimming pool. Inside is a great room, made up of a living area as well as a dining area. The gourmet kitchen has an open-concept plan and features curved granite counters and floors made from Travertine. The living area has an amazing, semi-circular wooden ceiling with furniture consisting of West Indies colonial-style decor. Hanging on the Virgin Gorda villa walls are original art photography shot by the villa’s owner. As you stroll along a stone walkway, you leave the main villa and arrive at another pavilion. This building has twin beds, French doors that open to a garden patio, an outdoor garden shower, in addition to chairs and a hammock to enjoy the flowers of the garden. To take a dip in the swimming pool, walk from the villa’s coralstone terrace. The pool is surrounded by giant boulders. The pool’s lighting is energy efficient, fiber-optic. Relax by the soothing sounds of a cascading water feature that falls into the pool. It’s a majestic paradise of relaxation and peaceful rest. You can contact a Virgin Gorda villa “On The Rocks specialist for details on available house cleaning services. The villa property is non-smoking. There is a countless list of luxury amenities to enjoy, such as a charcoal barbecue, beach chairs, snorkeling gear to swim in the Caribbean, cable TV, WiFi, and even EO organic body care products to take care of your skin. You can also work with a concierge specialist to arrange a private chef, airport transfers, spa and massage treatments, boat charters, tennis, golf and much more! Rates during the summer are $7,500 – $8,500 per week, $13,400 per week during major holidays and in winter, between $9,500 – $10,800 per week. Thanksgiving is a popular time so a minimum 7-night stay is required. Make your dreams come true with a stay in a tropical paradise. Pamper yourself with the beauty of the Caribbean and accommodations in a luxury villa from Wimco Villas. Make your vacation or holiday travel plans to the Caribbean and stay in luxury at the Virgin Gorda villa “On the Rocks”. The Life of Luxury can assist you with all your booking needs. Return again to follow this luxury blog and stay up to date with the latest luxury travel news and popular destinations from around the world.